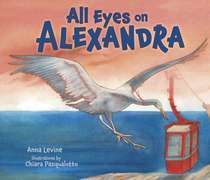 All Eyes on Alexandra, written by Anna Levine and illustrated by Chiara Pasqualotto. 32 pp., Kar-Ben, September 2018. The Whole Megillah (TWM): In this book, you’ve personified a family of cranes and used Abba, Ima, Savta, and Saba. How did you develop that idea? What led you to create a fictional family of cranes vs. a nonfiction approach? Anna Levine (AL): I was staying at a bed and breakfast in the old city of Akko (run by the author and translator Even Fallenberg). At 6:00 in the evening Evan invited us to climb up on the roof with his son, two translators from Germany, a writer and her husband, a couple from Paris with two rambunctious young children, and a friend of mine who’d come to visit. As the Muezzin sounded over the loudspeakers, the birds on their way south began to gather above. At first there was only a handful. Gradually, the cloudless evening sky filled, in what can only be described as a Hitchcock-like flock of thousands of beating wings circling above, turning the sky into a dark thrashing cloud. The swallows landed on electricity wires strewn haphazardly between the closely crowded buildings. We watched as they perched, settling in for the night, nudging the ones beside them to move and make room, hinting at an unknown hierarchy of who had rank to the better spot, as they nudged off fledglings to stake their claim. I think at that moment I visualized Alexandra with a very independent spirit and how she would strive to make a place for herself and stand out among the flock. TWM: What was the most challenging aspect of writing this book? AL: Getting the migratory flight path right! As I was looking at the final drafts with the almost completed artwork I realized that there was a problem. The birds flew over Syria, Lebanon and then suddenly they were over pyramids in Egypt and then swooped back to the Hula Valley. I was beside myself! I grabbed my computer and basically ‘flew’ over to the Jerusalem Bird Observatory. The director of the observatory, Alena Kacal, was wonderful, calmed me down and sat with me. In the end, it was an easy change to make. AL: Seeing the art work. I think every picture book author stresses about whether the art will live up to their expectations. When I saw Chiara Pasqualotto’s illustrations, I fell in love with the book as if reading it for the first time. Chiara is so talented. Her art brings the text to life. TWM: What made you think of Kar-Ben vs. other publishers? Or did your agent submit it? AL: I submitted it to Kar-Ben. If my book has a Jewish/Israel theme, I think of them first. I’ve been one of their authors for many years, since Judye Groner brought me in. Now I enjoy working with Joni Sussman and Amy Fitzgerald. Jill Colella is very hands-on when it comes to thinking up creative ways to promote my books. It’s exciting to be part of the whole process. Kar-Ben feels like home. For more about Anna Levine and her work, please visit her website. This entry was posted in Authors and tagged All Eyes on Alexandra, Anna Levine, Kar-Ben. Bookmark the permalink. Thank you, Barbara. Really enjoyed this interview. Wishing you and all your readers a Shana Tova! Thanks again for the interview. A happy and healthy New Year to you and yours, too! Great interview, Barbara! Anna, mazel tov on the new book!